If you’ve grown a bit tired of maintaining a proper beard shape, or think it doesn't fit your face anymore, and have decided to take the plunge and shave off the beard. It sounds pretty easy in theory—just lather up the beard and shave it off. However, it’s not necessarily as easy as it seems. If you shave your beard wrong, you could leave your face an irritated mess. It’s important to do it the right way. You just have to learn what that is. If it’s been a while that you’ve had a beard, you should know that the skin under the beard may be a bit lighter than the skin on the rest of your face—which is an important thing to know in case you have a meeting the next day. Your skin will also be a bit more sensitive, since it hasn’t been shaved in a while. Unfortunately, this can lead to razor burn or ingrown hairs. It’s best to shave the beard at the start of a weekend during which you have no social obligations, so you give your skin a few days to adapt and get some color. It will also give you a chance to get used to your new look before you reveal it to your friends and co-workers. 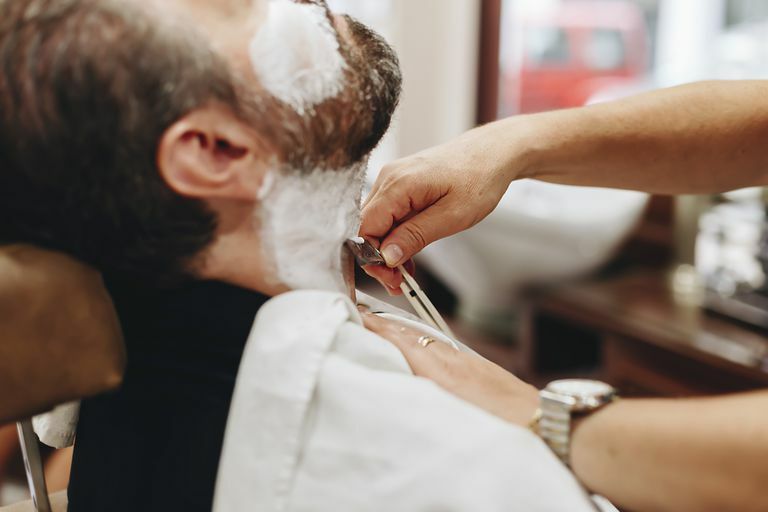 Prior to shaving your beard, you should trim it down as closely as possible with a beard trimmer or set of clippers. Shaving a full beard with a standard razor is ineffective because the razor won't be able to get to the root easily. It’s always best to shave at the end of a shower, because the beard hair is softer and your pores will be more open. Use a high-quality shaving cream and a sharp razor. Lather the face and, using your free hand, stretch the skin tight. Shave carefully with the direction of the hair growth, making sure to rinse the razor every so often. When you're done, rinse the face and visually check for any rough spots—if everything looks smooth, stop. If you need to touch up any spots, repeat the other steps. Since it’s been a while since you’ve shaved, avoid shaving against the direction of your hair or trying to get too close. Once you’ve finished, rinse the face with a splash of cool water to close the pores. Finally, use a good after-shave moisturizer to promote healing and moisturize the skin. The beauty of facial hair is that it's a quick and inexpensive way to change up your look and keep it fresh. If, after you’ve shaved your beard, you decide that you prefer a little facial hair, you can always grow your beard right back.